You Might Be Committing These Mistakes Today! As an owner of a wholesale or distribution business, you’re doing everything possible to maintain your razor thin margins but — surprise, surprise — you’re bound to make mistakes along the way. You’re keeping a constant eye on your prices, costs and ultimately profits. But profits aren’t everything if you have the long-term viability and survival of your business at heart. As some of you may know, EMERGE App was born out of an in-house inventory management solution for a custom t-shirt printing business that our founder ran while in school. So you bet that we’ve been there and done that, often falling on our faces in the process, or left licking our expensive wounds. It was a painful learning experience! But it ultimately brought respectable profits and a pivot to the inventory management solution that you see today. 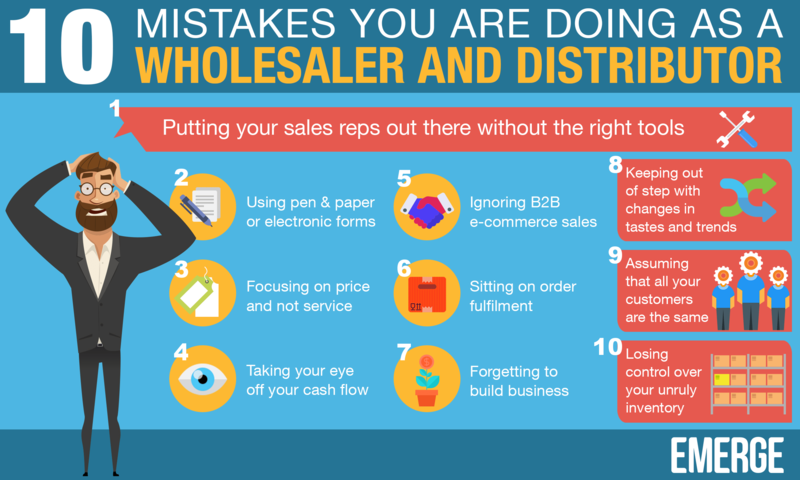 Now, we want to share with you common mistakes that wholesalers and distributors commit in the running of their business. Hands up if you’re using pen and paper to take down your orders over the phone or in person? Don’t be shy. You’ll be surprised how many mom-n-pop businesses are still using paper today to run their businesses. And you thought carbon paper was long gone! I can understand the allure of pen and paper. It’s physical and it doesn’t need batteries. However, the flip side is that paper needs to be eventually stored somewhere. It’s going to be filed away in some folder that will be put in some box sitting in some warehouse. And it isn’t easy to share a single paper copy across your business. Do you get the drift? Some businesses have gone further with PDF forms and spreadsheets. But are they really solving the problem? Or just putting another spin on it? Electronic forms and spreadsheet files still need to be saved somewhere and trust me, there will be multiple versions of the same file to be found! 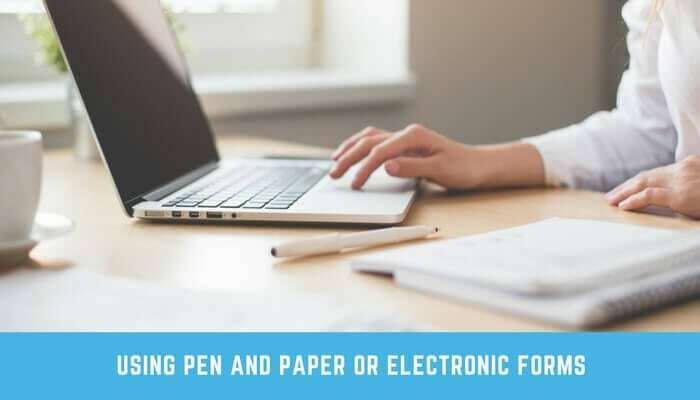 Simply put, paper and electronic forms don’t scale with your business, they need to be stored in one secured place, nor are they easily shared among employees. As you know, the buzz word for this decade is the cloud. You should be storing documents in the cloud for easy access and effortless sharing from one place. Better still, you should banish the idea of documents and files altogether. Have them dynamically generated when needed so that you can be assured of the latest, updated version. Any decent and respectable inventory management solution should allow orders to be entered and invoices generated on the go. Mobility is the keyword here. It doesn’t matter whether you’re out selling in the field, at a cafe or back at your hot desk in the office. As the main drivers of your sales, your sales reps should be equipped with the right tools to sell and service your customers. In this hyper-competitive mobile web world, this means much more than nice business cards, a smartphone and a laptop or tablet. Today, this means keeping your sales reps well informed about products, stock availability, promotions and expected delivery times. Keep them misinformed and your sales and customer service levels will suffer in the long run. 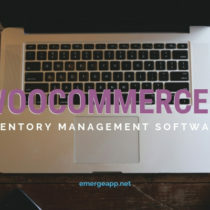 A robust inventory management solution, as previously mentioned, will put customer, supplier and product information at the fingertips of sales reps.
For customers, simple CRM features can do wonders for keeping up to date with customers. See their contact details, a summary of orders and invoices and all recent activities at a glance. For more in-depth info about their sales orders, list their recent orders and see their status, fulfilment and payment stages. Drill down on individual sales orders for more details or quickly generate PDF documents from them. Use tasks and notes to attach remarks or documents about the customer in a single place. And share these with the rest of your sales team! Plus get shortcut buttons to receive payment for invoices or debit notes, and to quickly create quotations and sales orders while you’re out and about. The software should adapt to your workflow and not the other way around. With EMERGE App the sales process is presented in a logical and sequential manner: quotations, sales orders, purchases, shipment and invoices. In the past, it was a reasonable business strategy for wholesale distributors to focus on price as a competitive advantage. It was hoped that lower prices, and the slim margins from them, could be offset by a higher volume of sales. This might have worked in the era before the Internet. However, today it’s a different ball game altogether. The competition in wholesaling and distribution has just been turned up a notch. Nowadays products are increasingly commoditized. And it’s very likely that your competitors are sourcing from the same manufacturer or supplier. Plus, there’s the holy grail of perfect markets: well-informed buyers and sellers transacting in a rapidly changing market. The Internet, and now the mobile web, has changed all this. Buyers and sellers are able to find the best deals for themselves 24/7. 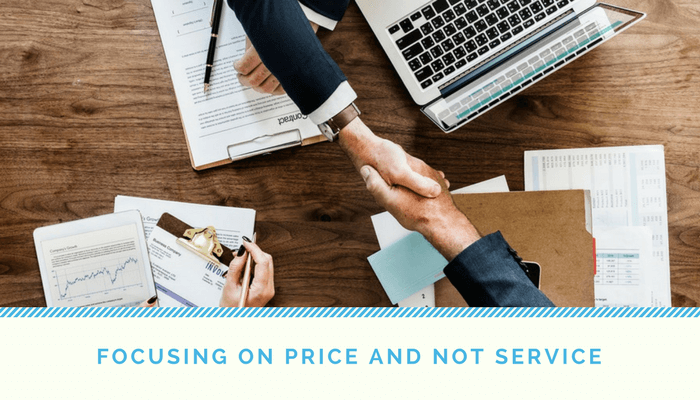 You need to shift your mindset away from lowering prices (and hurting the industry in general) to provide an unparalleled level of service to your customers. In fact, lowering your prices to the point of absurdity may attract the wrong type of customer, one that will readily switch alliances between wholesalers and distributors at every opportunity to save dollars. You might have heard about WOWing your customers. Yes, you need to do this by anticipating, surprising and delighting your customers with every interaction. Another thing is to improve the buying experience for your customers. This means bringing purchasing into the Internet age and making it convenient and painless for them to purchase from you. We’ll explore this next. 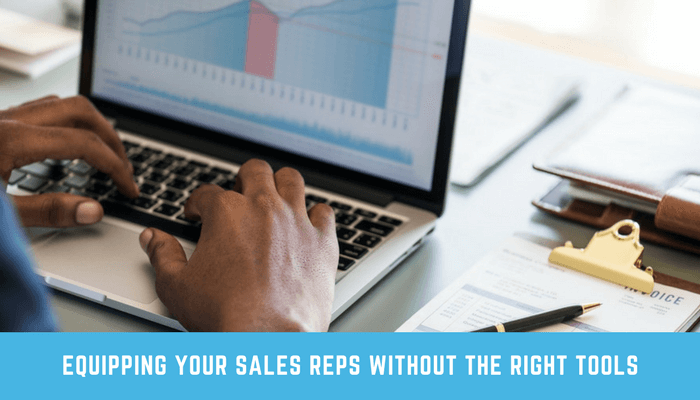 Right now you’re probably doing just fine humming along with your sales. You’ve been doing the right thing all these years and you’ve been busy taking orders by phone, email, instant messaging or even fax (do people still use these anymore?!). But what if you could open another sales channel, one that doesn’t really a great deal of monitoring, employees or yet another brick and mortar presence? You can with business-to-business e-commerce. Frost & Sullivan projects that B2B e-commerce will hit $12 trillion in sales worldwide by 2020, up from $5.5 trillion in 2012. Can you afford to ignore this monumental change in the way business is done? You can be a part of this too with EMERGE Cart, our B2B e-commerce platform built into EMERGE App. Simply create customer purchasing accounts and start receiving sales orders seamlessly in the app. 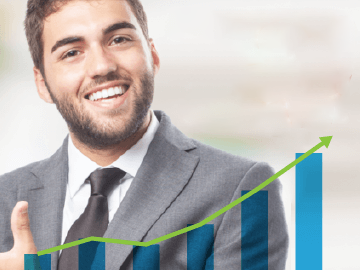 Let’s see how EMERGE Cart helps you to sell more. Firstly, each customer has their own exclusive and unique login. This allows for individual price lists and products. Secondly, product lists can be personalised for each customer. You can sell different products to different customers. Just customise what products and categories your customers can see. Thirdly, we understand that business relationships change all the time. Control it with customised pricing and tag your price lists for different groups and customers. Finally, your customers will enjoy the convenience of shopping with you. Previously, they would have to call, email or fax their orders to you. Now, your customers can simply log in to EMERGE Cart via a desktop or mobile web browser, browse their personalized catalog and then checkout. Up to this point in time you’ve probably treated all your customers the same way and put them in the same basket. You simply served them and sold them the goods whenever orders came in. However, to turbocharge your sales and keep your customers loyal, you need to keep a laser focus on different customers and their specific needs. If you’re a wine and spirits wholesaler, for example, the profile of customers that buy crates of beer in the hundreds will be very different from those who buy rare red wines, half a crate at a time. Practicing market segmentation means separating customers into different groups with different promotions and marketing strategies to target them. Furthermore, you read earlier that it’s possible to have different price lists for different customers in EMERGE App. So, for example, a wine and spirits wholesaler can have a wild rock ‘n roll discount for beers during summer, and a more dignified promotion for red wines during the winter holiday season. 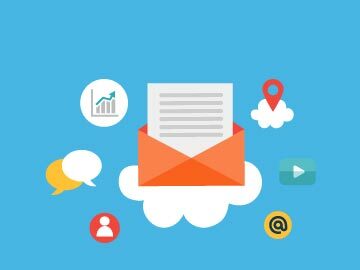 By segmenting customers you are able to break down and track your sales in a meaningful manner and improve your sales prospecting and marketing strategies. Don’t forget to align your sales strategies with the overall strategy of your business! It’s easy to keep out of step with changing consumer tastes and trends when your existing product catalog is serving you well and your sales are growing year-on-year. As a fine food distributor, for example, canned plum tomatoes get consistent orders every month from Italian food retailers, restaurants and cafes. They count as a staple in any respectable kitchen. But what about organic San Marzano plum tomatoes? They are said to deliver a far superior taste thanks to the volcanic soil they are grown in. Plus the organic tag helps as well. They’re considerably pricier than ordinary, run of the mill plum tomatoes but purists swear by them, especially for simple dishes where the tomatoes are the star. The margins are considerably higher for them, too! Adding them to your product catalog might sway some existing buyers over to them and grow your sales in the process. Or they may open up accounts with new customers who otherwise might not have purchased from you if not for sourcing this uncommon tomato variety. And remember our wine and spirits example? It’s no secret that beer sales are declining around the world. It’s a reflection of a shift in consumer tastes as many move to having a drink with their food, or as aperitifs and digestifs before and after a meal, respectively. This means sourcing and stocking up on dry and sweet alcoholic beverages such as Champagne or whiskey, and moving away from beers and mixers such as vodka. The margins on these are higher as well! Sometimes it’s worthwhile to put yourself in your customer’s shoes for order fulfilment. Benchmark yourself against some metrics. 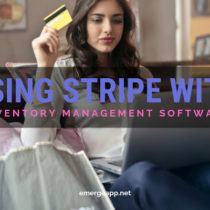 We covered some important metrics here at https://emergeapp.net/inventory-reports/10-inventory-metrics-for-smbs/. Otherwise, the customer order cycle time is the one that you need to keep an eye on. This is the average time it takes from order placement by the customer to final delivery. How did you go? Were you able to fulfil the order with the accepted industry average? If your processes are efficient, your cycle time will be shorter. If they are inefficient, they will be longer. You may have trouble attracting and keeping customers if your cycle times are long. If you have multiple sales channels, such as sales reps, B2B e-commerce, or online stores at Amazon or eBay, EMERGE App will consolidate all these orders in one place for faster fulfilment, and thus shorter cycle times. As a wholesaler and distributor, things have been very transactional to date with lots of customers, high order volumes and slim margins. It’s been working for your grandfather, your father and now you. So why change the recipe? By focusing on prices and operations, you might have forgotten to build long-term relationships with your customers. Why have hundreds or thousands of ad-hoc customers when you can consolidate large orders with fewer, regular customers? This makes for less paperwork for sure! Remember that competitors are happy and waiting to scoop up your lost orders. 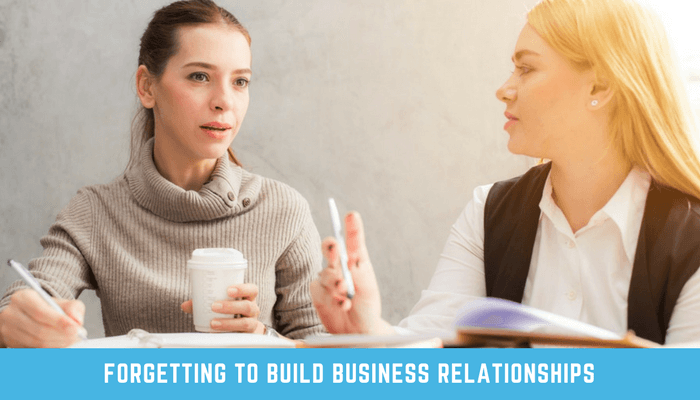 What’s going to make you successful in the long-run is your ability to form strong business relationships and bonds with your customers. And this may mean relationship building and entertainment outside of the office as well. On the business side, WOWing your customers as highlighted earlier, making things convenient for them, and fulfilling their orders quickly means gaining trust and a repeat customer for life. 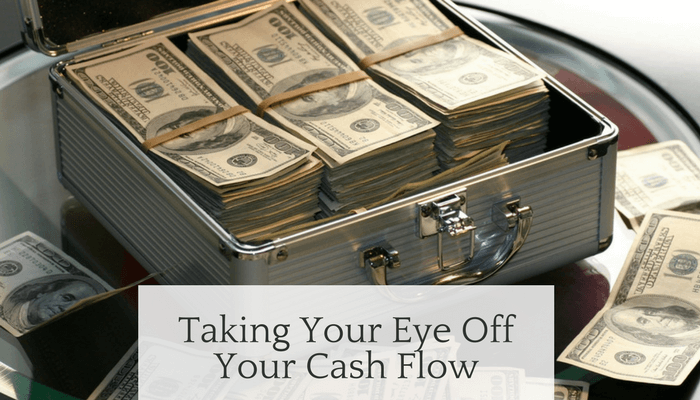 When things are going well and your sales are steady but growing, it’s too easy to take your eyes off the cash flow in your business. Cash flow, for just about any business, is critical. Get a choke in your cash flow and business will grind to a complete halt, despite stellar sales or skyrocketing profits. Why? One mistake is to overextend credit to your customers. Don’t be generous with extended payment terms from customers. Be proactive about collecting receivables. Expand your payment types to include credit cards and PayPal, for example. Make it easy for customers to pay your invoices online. Most importantly, stay informed about your business financial health at all times. Use your inventory management solution to generate or export reports for cash availability, sales, payables and inventory, for example. EMERGE App allows you to break down your sales reports by customers, products, raw materials, product category or company. You can further filter sales by their status or by a customer, supplier, product, category or sales rep. Furthermore, see the statement of accounts to manage your cash flow for receivables from customers and bills payable to suppliers. And age them based on date ranges of 30 days. Also, it would be great if your software integrated with popular cloud accounting packages such as Xero and QuickBooks Pro to avoid data re-entry and to keep your accountant happy. And for the final, biggest mistake you could be making as a wholesaler and distributor, is to lose control over your inventory. Getting control over your inventory means more productivity and efficiency, better decision-making, lower costs and, ultimately, higher profits. EMERGE App shows inventory stock count in three different ways to help you make decisions about sales forecasts, stock sufficiency and stock re-ordering. Sometimes you may need to do a manual stock adjustment due to damaged cans. This will affect both the in-stock and available quantity in your inventory. At times you may want to transfer stock from one location to another, especially if you have many storage locations. A stock transfer will adjust the in-stock and available quantity at both the source and destination stock locations. Do regular stock takes for fast selling items and annual stock takes for slower items. 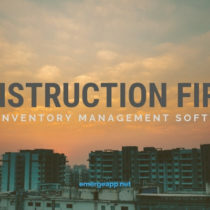 Finally, get a complete picture of your stock ins and outs with an inventory movement report. With this, you will know the exact quantity of incoming and outgoing stock for every item, in any location, on any date. What Mistakes Are You Committing Today? You cannot see these mistakes in isolation and many impact others. If your cycle time is getting longer, for example, you’re going to surprise your customers the wrong way. You’re certainly not going to earn a repeat customer. And you may find that collecting receivables from this customer is getting longer, too! So, don’t be shy. How many mistakes are you making today? Fix them right now. Take a good, hard look at your business and use a proven inventory management solution to address them.